Another Black Boy Was Killed by Police. Will Justice Be Done This Time? Every time a black person dies at the hands of a police officer, there’s a glimmer of hope that the police will be held accountable. Almost every time, that hope is in vain. 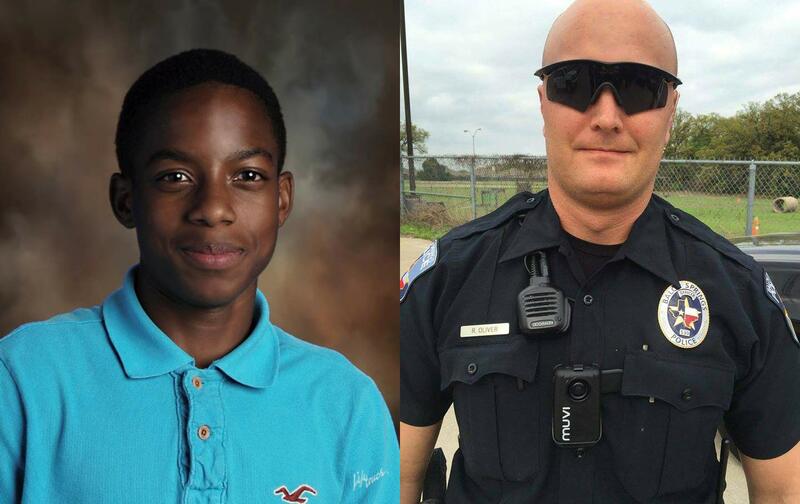 On Saturday night, Jordan Edwards, a 15-year-old black boy who was said to be well-liked, died after Balch Springs police officer Roy Oliver fired his gun at the car in which Edwards was riding. Oliver shot Edwards in the head, and Edwards succumbed to the wound at a nearby hospital. When I first saw Edwards’s school picture on Monday, I smiled. The cheesy background, the adolescent forehead acne, the half-smile—like he wanted to bare his teeth but knew that would slash his cool in half—were all familiar. It’s the kind of photo I remember putting in my middle-school diary—scored from a boy I had a crush on, after giving him mine. I wondered whether Edwards gave his crush this school photo, and if the crush pasted it in their diary with a heart around it like I once did. And then I remembered Edwards was dead and that the diary entries of those who knew and loved him would never be about him as a person who lives. The story of a black boy shot dead by law enforcement is a regrettably commonplace one at this point. Last year The Washington Post found that even though black Americans represent only 13 percent of the population, they are 24 percent of those fatally shot and killed by law enforcement. The photo of Edwards feels particularly reminiscent of the widely circulated photo of Jordan Davis, another teen who was shot in a car by a white man, in 2012. And every time this happens, there is always a glimmer of hope that the justice system will bring accountability to the perpetrators and the police department they work for. I remember that sense of hope right before the it was announced that no charges would be brought against the officer who shot dead 12-year-old Tamir Rice. Surely, I thought, justice would be brought for a child. I was wrong. Then there was Freddie Gray, whose death sparked powerful civil unrest in Baltimore. After the state’s attorney, Marilyn Mosby, brought charges against the officers involved in his death, I thought, surely, they’ll be found guilty. Instead, two officers were acquitted and then the prosecutor’s office decided not to proceed on the charges brought against other four officers involved. And I remember feeling that sense of hope when it was a possibility that the cops involved in the shooting death of Louisiana man Alton Sterling could face federal charges. On Wednesday, in the midst of news over Edwards’s case, the Justice Department announced that it would not seek charges. I can count on one finger the times a police officer has even gotten to the point of guilty plea in a high-profile case—once. On Tuesday, Michael Slager, the officer who fired eight rounds and killed 33-year-old Walter Scott, pleaded guilty to the charge of violating Scott’s civil rights by using excessive force. But that glimmer of hope returned on Tuesday. This time, the police admitted that the story they originally gave to the public—that police fired shots at the car Edwards was riding in because the driver of the car was backing it up and using the car as a weapon—was false. The officer was even fired from the force. Balch Springs police chief Jonathan Haber did not mince words about holding the officer who shot and killed Edwards accountable. “From our policies, which I went by, there were violations. I acted on them,” Haber told the Dallas News on Tuesday evening. Balch Springs is a suburb of Dallas, which employs one of the largest forces in the country, and its police chief, David Brown, “a reformer,” has dedicated his career to improving relations between community members and police by advocating for a reduction in the use of force. Now that a tragedy has taken place, the police department in Balch Springs might be trying its best to respond to the needs of Edwards’s family and the community at large. But the department already knew that Oliver was troubled. According to an NBC News report, Oliver was ordered to attend anger-management classes in 2013 after he lashed out on the stand in court. Arisha Michelle Hatch, a managing director at the racial-justice organization Color of Change, is wary of labeling the response in Balch Springs as progress. “Such a low bar has been set for responsiveness from police and prosecutors in tragic situations like these—so from that standpoint, the decisions made by the Balch Springs’s police department to correct the record about the events that led to Jordan’s death and to fire one of the officers feels extraordinary,” she tells me. But there are “troubling signs,” she said, that point to “deeper problems” in the department. Edwards’s brother, who was in the car with Jordan, was held in jail after his brother was shot in the head, but the police officer who shot Jordan was not. Hatch also wonders why the district attorney hasn’t made a statement, why the video of the shooting hasn’t been released to the public, and why the officer hasn’t been arrested. “There’s still so much work to do to shift to a culture of accountability around policing,” Hatch says. No matter how proactively the Balch Springs PD responds to this killing, without a Department of Justice that seeks to hold police departments accountable, as it did during the Obama era, the actions taken by this suburb will be just a blip, an anomaly. The change in administrations—from a Department of Justice committed to reducing police violence against black Americans, to one that seeks to eliminate all traces of that commitment—makes the fight for police accountability even that much tougher for families and communities impacted by excessive force. Under Obama, the Justice Department did indeed make strides in holding individual police forces accountable. After 18-year-old Michael Brown died in a police-involved shooting in Ferguson, the DoJ investigated the police department and published a damning report that said there was a pattern of discrimination against the city’s black residents. The department did the same thing in Baltimore after the death of Freddie Gray. The DoJ also entered into formal agreements with 15 troubled police departments across the country to reduce discrimination. But since Jeff Sessions took the helm at the Justice Department, he has made it clear that he is committed to rolling back the incremental and institutional changes the former administration’s DoJ had set in motion. Sessions has announced that he plans to review all existing reform agreements between the DoJ and police departments and has said on multiple occasions that criticisms of police departments leads to an increase in crime. Without federal oversight, troubled police departments that do not already have a strong commitment to accountability will continue to shoot and kill unarmed black men without an iota of fear that they will be held responsible. And that is a terrifying possibility. Collier MeyersonTwitterCollier Meyerson is a Knobler Fellow at the Nation Institute, where she focuses on reporting about race and politics, and an investigative fellow at Reveal.